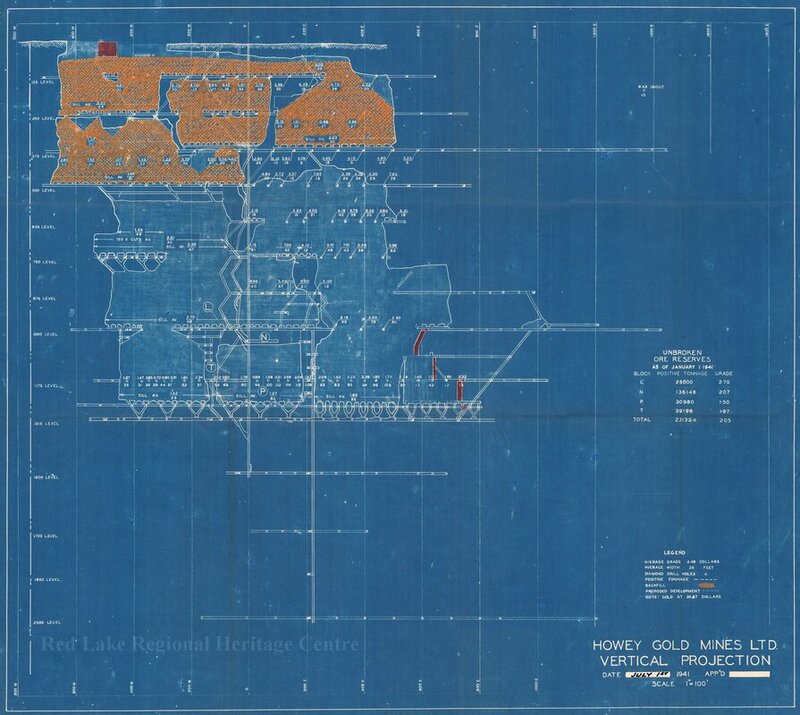 After reading Dr. E.L. Bruce’s 1924 mineralization report on the Red Lake Region, Lorne Howey became interested in Red Lake's potential for gold. He teamed up with his brother-in-law George McNeely to form the Howey Red Lake Syndicate. The pair left for Red Lake in May 1925, accompanied by Lorne Howey's brother Ray Howey and W.F. Morgan, who were working for McIntyre Porcupine Mines. The men settled on Burnt Bay and prospected without any success throughout the summer of 1925. The group was attempting to relocate to Woman Lake, when luck struck. On July 25, 1925, Lorne Howey and George McNeely discovered a quartz stringer with visible gold under the roots of an upturned tree. Nearby, Ray Howey and W.F. Morgan found part of the same vein (which ranged from 2.4-12.5 metres wide). Ray Howey and W.F. Morgan staked nine claims for McIntyre Porcupine Mines. ​Lorne Howey and George McNeely made thirteen claims, which would become Howey Gold Mines. After returning from Red Lake, Lorne Howey and George McNeely turned to mine promoter Jack Hammell (Canadian Mining Hall of Fame, 1991) for funding. After seeing the sample results, Hammell travelled to Red Lake to verify the find himself. Satisfied with the results, Hammell formed the Howey Gold Mines Syndicate and optioned a 75% interest in the property to Dome Mines in the fall of 1925. 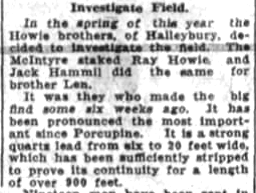 News of the Howey discovery was published in The Ottawa Journal on October 10, 1925 and would bring thousands of the prospectors to the Red Lake region in 1926. Not wanting to lose momentum, Hammell convinced the Provincial Forestry Department to loan him their planes to move equipment to the Howey mine site before winter set in. Thanks to Hammell's creative thinking, work began on the Howey site in late 1925. In 1926, Hammell was forced to refinance after Dome Mines dropped their option. Howey Gold Mines Ltd. was formed in October 1926, with Hammell serving as the president. Horace Greeley Young (H.G. Young), an mining engineer was brought on as the mine’s first manager. Development on the site started in earnest in 1927, with shaft sinking, exploration, building construction (employee housing, offices and mill) and hydro electric development underway. 1929 saw the completion of the shaft and a 500-tonne mill at the open pit mine. Howey Gold Mines pour its first brick on May 12, 1930, and its shareholders started to receive dividends in 1934. Howey Gold Mines was forced to close in November 1941, due to a shaft pillar collapse and subsequent cave-ins. Equipment was sold to other mines if possible, while the rest was abandoned. The shaft was finally pulled down in July 1946, and the mine was left to flood. Throughout its eleven-year lifespan, Howey Gold Mines produced 421,592 ounces of gold. 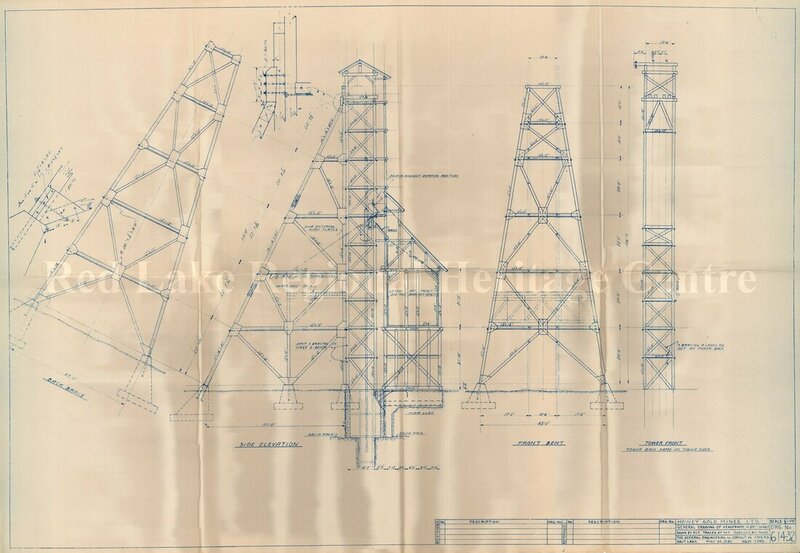 Buildings from the mine were reused or donated to local causes and in July 1946 the headframe from Red Lake's first mine was torn down. While Howey Gold Mines was only in production for a just over a decade, the impact that it had on Red Lake has been lasting. Its influence and that of its pioneer founders can be seen all over Red Lake. These influences range from business names to the town layout to the renaming of Burnt Bay to Howey Bay. With an upsurge in revisiting old mine sites, only time will tell if this pioneer mine will a get a new life.